The new Hocus Pocus cocktail at Mongoose versus Cobra. Photo courtesy of Mongoose versus Cobra. 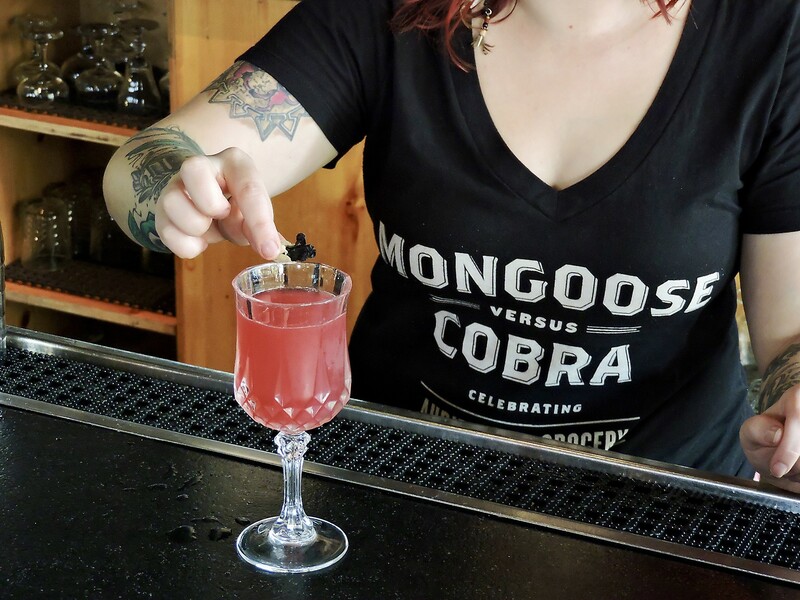 Cocktail lovers who are looking for something new should have more than enough to keep them occupied at Mongoose versus Cobra, located in a historic building that’s over 100 years old at 1011 McGowen. The new drink list features nearly two dozen classics and bar-staff originals. Many of the cocktails feature comforting, cool-weather flavors, such as maple, sage, cranberry and tea. A group of Houston Food Finder readers (who signed up for a chance to attend) got an early look at the new cocktails. “The menu switch-up is an opportunity for Mongoose versus Cobra to showcase local flavors and produce and give drinkers new reasons to return,” said Adele Corrigan, director of operations. One such example is the Hocus Pocus, a gin-based cocktail that gets its attractive hue from fresh blackberries and classic autumnal notes from sage and cardamom. Corrigan said the new menu was driven in part by lead bartender Josh Alden, (formerly of Moving Sidewalk). “He’s come on board and worked with staff, encouraging them to experiment and help curate the current list. It was a true group effort for the bar,” Corrigan says. The new Mercado Flip cocktail at Mongoose versus Cobra with sotol, amontillado sherry, lemon, sweet corn, habanero and a whole egg. The drink was created by bartender Brenda Arredondo. Photo courtesy of Mongoose versus Cobra. Two different tea-based cocktails are on the list and each is inspired by influences both far away and close to home. The first is the Bolo Thai with bourbon, nitro Thai tea, carrot and coconut milk. Bartender Joey Connely said it’s his homage to the nitro Thai tea that’s always on tap at the Heights location of The Rice Box. Gold Rush #3 cocktail at Mongoose versus Cobra. Photo courtesy of Mongoose versus Cobra. “Tea, to me, is such a great cool-weather drink,” said Corrigan via a press release. 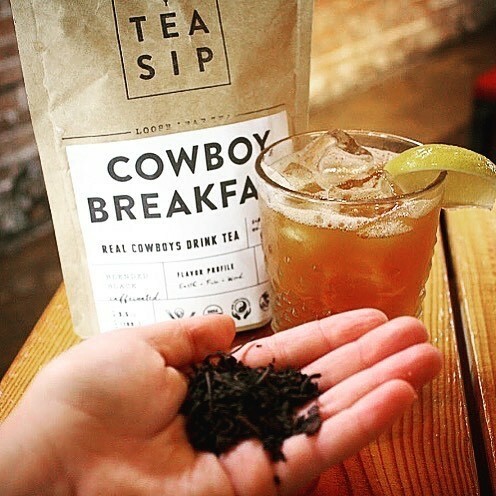 “I think of dry leaves and fragrant spices it reminds me of when I was a kid and I’d go camping in Enchanted Rock and Pedernales Falls.” To that end, there is a second tea cocktail called Gold Rush #3. It’s a riff on the classic Gold Rush cocktail made with Tea Sip’s Cowboy Breakfast tea, infused Benchmark Bourbon, lemon and honey. The loose tea is sourced from Tea Sip in the Heights. Possibly the most out-of-the-box new cocktail of all though is the Mercado Flip. 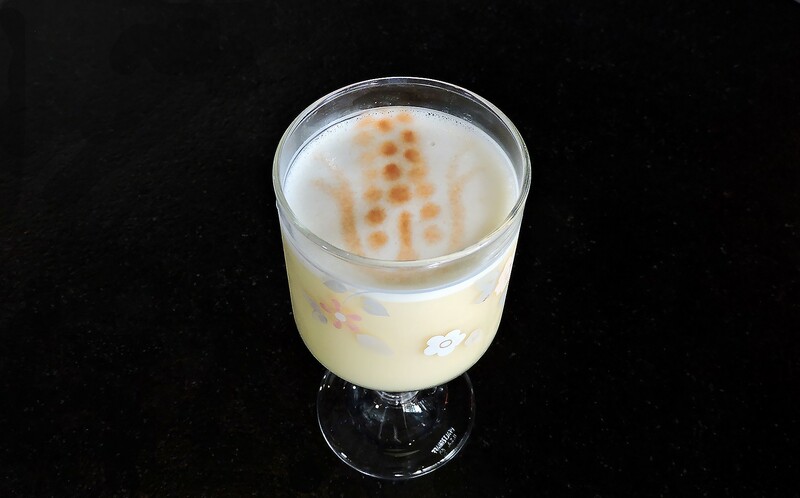 Created by Brenda Arredondo, formerly of Boheme, the drink gets a sturdy hit of sotol and habanero that’s tempered by slightly buttery, sweet-corn infused cream, sherry and lemon. A whole egg lends texture and a golden tone accented by an artful image of an ear of corn carefully stenciled on the surface with Angostura bitters. Guests who tend to steer towards classics with a twist might aim for the White Negroni. Rather than gin being blended with the traditional Campari-and-vermouth combination, it’s instead combined with Dolin Blanc vermouth and Suze, a French, orange-tinged aperitif. There’s also the Jungle Bird, a classic combination of Cruzan Black Strap and Ron Abuelo rums with pineapple, lime and Campari. Mongoose versus Cobra is open Monday through Friday from 4 p.m. to 2 a.m. and Saturday and Sunday from 2 p.m. to 2 a.m.